I would've found it hilarious if this costume was actually intended for Vanille. There's something about the mental image of her doing the sneaky, sneaky, stab you in the neck thing that amuses me. So is this what people do now? Didn't MGS4 have an Altair costume in it? Now that I think about it, didn't Ezio have a Cyborg Raiden costume in Brotherhood? Still, it isn't the weirdest crossover I've seen. But it seriously bothers me when you put up such misleading titles for your articles. You guys should be classier than that: there are some things which shouldn't be done for the sake of that extra page-view. Please, just tell it straight in the future. You have to admit that Ezio's outfit is freakin' badass. I wouldn't be surprised if Renaissance clothing becomes the new fashion in a few years. That is all I care to say about that. I didn't think anybody cared about ff anymore. Unfortunately, it looks like I'm wrong. Why take a decent character and insert him in a game that'll prolly wind up being crappy? Oh, my bad. His clothes. Yeah. Not even him. Someone stole his shirt. Wow. Please tell me this means we're getting Squaresoft again. What's with Ezio and AAA Japanese games? Soul Calibur and now Final Fantasy? Pretty soon we'll have Ezio be playable in Super Smash Bros. or something. But that would still be awesome. When the haystack was in Peace Walker and Raiden appeared in Brotherhood, it seemed meaningful, like those two had an important relationship. Now? AC is the no pants wearing whore who gives it out to all takers. Stay away from that glammed up tart people, Renascence syphilis still has no cure. What's with Ezio and AAA Japanese games? Soul Calibur and now Final Fantasy? Pretty soon we'll have Ezio be playable in Mario Tennis or something. I don't know about that, but this seems plausible. I realized that just as I hit "Post". I changed it right afterward. Kinda wish it had been KH with the actual Ezio making an appearance. Or even better, have Aya show up in the game. Or perhaps if you're going to do costumes, do "classic" ones by having the characters wear either old protagonist clothes or make their own clothes look like they were in the style of one of the old games (strangely enough, as I thought of this, I realized Ezio would have actually fit with the style of IX with it's Renaissance style, and that if they wanted a character that would fit with this, they'd could probably work with Adam Jensen). I've been had! I thought Ezio was going to do a cameo or something. Instead, it's just his costume. It's still looks good, but I'm not getting any DLC. Especially when it's just changing the clothing. Desmond Miles as ... Cloud Strife. We'll get FF VII one way or another. I agree. This title definitely gives the idea that Ezio himself will be in FFXIII-2, the idea of which made me go WTF?! 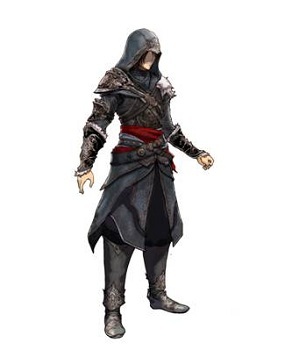 In reality, it's not Ezio, but Ezio's costume that will appear in the game. The article title was quite misleading. I love Assassin's Creed, and I am long-time fan of Final Fantasy (though I hated XIII); the thought of Ezio being a playable character in a Final Fantasy game filled me with confused disgust. Ezio is the new Dante! Run for the hills! Gamestop's, which is a new oufit and weapon for Sarah (Which lets her attack faster, looks awesome, and has two different forms) or Amazon's, which has the Monster Arena and gives you Omega as a party member. Am I the "only one" getting the feeling that Ubisoft are getting really desperate? They've finally found a franchise that sells, so they put out a new one each year, put the main character (or the costume) in every game they can and are even making a movie about it. Amazon. There, did it for you. Sort of a guest appearance in FFXIII-2, appearing as a fighter in Soulcalibur V. All well and good, but we'll know if Japan truly likes the character when the "Adult Only" doujinshi comes out. More importantly, this gives me an idea for a crossover game. Rayman, Uncle Pey'j, and SoT-era Prince of Persia are recruited by Abstergo to test out a new project. The goal? Create some convenient accidents that erase any spiky-haired protagonist from Square Enix history. Wrench in an airship engine, misfiring gunblade, that sorta thing. And if your cover gets blown, you can call in assistance from any of the organizations listed under the Tom Clancy banner.